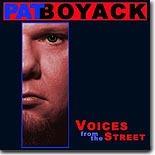 It took me a few weeks to decide what I really thought about Voices from the Street (Doc Blues), the new collection of urban power soul songs, some originals and the rest hidden gems from the past, from Texas blues guitarist Pat Boyack. It just didn't fit my pre-conceived notions of what to expect from Boyack, currently gainfully employed as the guitarist in Marcia Ball's touring band. After finally giving it a second listen, I now can't get Voices from the Street out of my CD players. Boyack gathered many of his Austin pals in the studio to record the 13 numbers most of which likely wouldn't fit in with anything else that these folks generally record. All of the songs contain the same basic theme --- tributes to common, every day people making a living through hard work. The singer to step the most from her comfort zone is Ball, who gets downright funk-ily sassy on the first cut, Robert Parker's "Listen To Me." Ms. Ball later returns to do more of a Marcia Ball-esque slow number, "These Are People," a Boyack original. Boyack comes in part way through the song with an extremely tasty guitar solo. One of the real revelations is the vocal work on three cuts from Ruthie Foster, who especially tears it up on the gospel stomper "Feel Like Goin' On." This is a song to play over and over. I obviously need to learn more about Ruthie's music, because she's certainly one of the stars of this collection. She gets downright funky and soulful on "Pushin' On" and presents a more classic soul sound on a tune, "Misery," co-written by Boyack and Shane Smith. Fans of The Bone Shakers will jump right to the three Sweetpea Atkinson numbers, with the usual raspy, soulful vocals to which we've become accustomed from this cat. "Chance At Love" has a contemporary, funky sound, similar to the kind of stuff we've heard Atkinson do with the Bone Shakers. (Yes, the backing singers include the aforementioned Ball and Foster). "Shotgun Slim" sounds like it could have come from the James Brown songbook, but is instead one written by Arlester Christian (aka Dyke of Dyke & the Blazers); it's the horn work of The Texas Horns that provides the prototypical JB sound. Regardless, Atkinson gives it his own unique treatment. It wouldn't be an Austin-based compilation without the presence of W.C. Clark, who brings his customary soulful blues voice to the gospel-ish number "The Power is Gone" and the slow, Boyack-penned soul tune "First Comes the Grievin'." While a very different style of singer than Atkinson, these two men both possess a lot of power in their voices. To have them together here is a very special treat. Larry Fulcher, veteran Austin bassist and sometimes member of Taj Mahal's band, gets to take the lead vocals on the Lee Dorsey street tale, "Who's Gonna Help Brother Get Further?" Fulcher also plays bass on on all cuts. The entire ensemble gathers for the closing number, a rip-roaring version of The Chambers Brothers' "Time (Has Come Today)." There is also a bonus at the end of the CD, with Wes Race giving a little political rap over a meandering instrumental track with the assistance of Miss Lulu's Lucky Number Dream Book. If you realize that this CD is not going to be straight-ahead Texas blues, you'll find Voices from the Street to be a rewarding trip around the city.